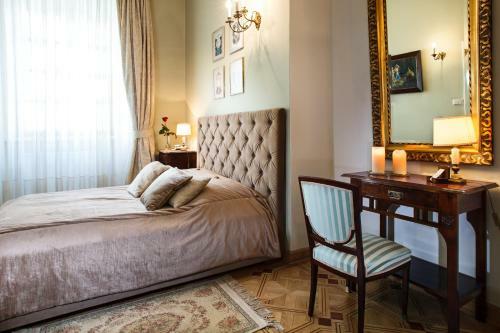 Bed and Breakfast Boutique Residence - Rynek 16 in Lublin is a B&B with 6 Rooms. Located in Lublin’s Old Town, property "Boutique Residence - Rynek 16" - awarded by the president of Lublin as one of the places showing the tradition and history of Lublin - offers accommodation in a historic town house. All apartments have a flat-screen TV and a private bathroom. The apartments of the "Boutique Residence - Rynek 16" feature interiors inspired by Art Deco and the Arts and Crafts Movement. Each one has a seating area with a sofa bed and a kitchen or kitchenette with an electric ...kettle, a refrigerator and a coffee machine. There's "16 Stołów" the award-winning restaurant with Polish cuisine on the ground floor of the property. Guests can also use a luggage storage. Airport shuttle service and guided tours to the Old Town and Majdanek Nazi Camp are also available. Lublin’s main railway station is a 7-minute car ride away, and The Lublin Museum is within 450 metres. The Castle, as well as the main bus station, is a 5-minute walk away. Located in Lublin’s Old Town, property "Boutique Residence - Rynek 16" - awarded by the president of Lublin as one of the places showing the tradition... and history of Lublin - offers accommodation in a historic town house. All apartments have a flat-screen TV and a private bathroom. The apartments of the "Boutique Residence - Rynek 16" feature interiors inspired by Art Deco and the Arts and Crafts Movement. Each one has a seating area with a sofa bed and a kitchen or kitchenette with an electric kettle, a refrigerator and a coffee machine. There's "16 Stołów" the award-winning restaurant with Polish cuisine on the ground floor of the property. Guests can also use a luggage storage. Airport shuttle service and guided tours to the Old Town and Majdanek Nazi Camp are also available. Lublin’s main railway station is a 7-minute car ride away, and The Lublin Museum is within 450 metres. The Castle, as well as the main bus station, is a 5-minute walk away. When would you like to stay at Boutique Residence - Rynek 16? Children and extra beds One child under 6 years is charged PLN 0.01 per night when using existing beds. All children under 2 years are charged PLN 40 per night for children's cots/cribs. The maximum number of extra beds in a room is 1. Supplements are not calculated automatically in the total costs and will have to be paid for separately when checking out. Any type of extra bed or child's cot/crib is upon request and needs to be confirmed by the innkeeper. This property will not accommodate hen, stag or similar parties. Please note that check-in after 22:00 carries a PLN 50 surcharge. All requests for late arrival must be confirmed by the property beforehand.